4 stars: Took a while, but got what I needed. 3 stars: Eerily friendly cashier weirded me out; there was hardly any bagged lettuce left. 2 stars: Constant gridlock. Teeth gritted the whole time. 1 star: Anarchy. Like the ending of Lord of the Flies. What does the ending of Lord of the Flies look like? Check out BuzzFeed’s “The Nightmare Of Shopping At Trader Joe’s In Manhattan.” It’s one thing to have to mark where the line starts; it’s another to need a sign marking the middle of the line so clueless (or super-aggressive) shoppers don’t cut the queue. What then is a shopper to do? According to a recent Slate piece, the answer is to shop while in line (The Six Rules of Line-Shopping at Trader Joe’s, Aug 24). Not long ago I was waiting in line at the smaller-than-average and perpetually mobbed Trader Joe’s near Union Square in Manhattan when I noticed the shopper in front of me had come up with a clever, possibly devious solution to the crowd problem. Upon entering the store, she claimed a shopping cart and staked out a spot in the checkout line (which snaked around almost the entire perimeter of the store). She proceeded to do all her shopping from her place in line: picking up produce as the line crept through the produce aisle, frozen goods as it passed by the freezer case, cereal when it neared the cereal section. I cut my academic teeth doing work on supply chain contracting. I consequently found a BBC report on pay-to-stay payments interesting (Premier Foods accused over ‘pay and stay’ practice, Dec 5). The subject of the report is Premier Foods, a large UK manufacturer with several food brands. Premier had the chutzpah to effectively ask its suppliers for bags of cash. Here is what the firm’s CEO wrote. He added: “We will now require you to make an investment payment to support our growth. “I understand that this approach may lead to some questions. But when a supplier raised questions in an email about the annual payments, another member of Premier’s staff replied. You can contemplate the lovely Britishness of “nominated for de-list” while watching this video on the subject. I should note that Premier Foods has since backed off its demand after the negative press following this report (see here). How should a supermarket organize its checkout lanes? 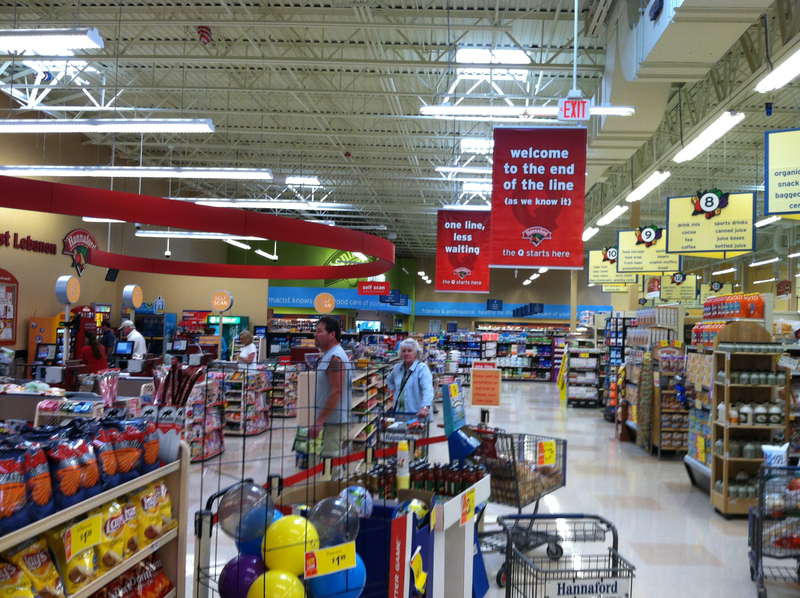 Is the express lane in the grocery store always the fastest lane? That’s a great question and its the subject of a “Dear Mona” column over on FiveThirtyEight (Dear Mona, Which Is The Fastest Check-Out Lane At The Grocery Store?, Oct 16). Mona attacks this question by heading into the queuing theory weeds. I couldn’t find much research on express lanes specifically, but one paper from Amsterdam found the reduction in wait times for express-lane customers didn’t offset the overall increase in wait times for everyone. Maybe life would be easier if the supermarket didn’t have an express lane — or, better yet, if it got rid of multiple lines altogether and had all customers join a single infinitely sprawling line where there were no winners and losers. That might sound nightmarish, but the math actually suggests it would be anything but. That math comes from queuing theory, a subject of study that’s been around ever since Danish mathematician Agner Krarup Erlang discovered a method for managing telephone traffic in 1909. To answer your question, I’ve had to take a crash course in (more modern) queuing theory, including examining formulae that calculate how average wait times at the grocery store vary depending on the type of line you join. I should state upfront Mona on the whole acquits herself quite well on this. But there are a couple of points worth mentioning. First, there in fact supermarkets that run with a single queue, like this Hannaford’s in West Lebanon, NH. As you can see, that singe serpentine queue ends up chewing up a lot of space at the front of the store. That’s a lot of real estate to give up when you only have two people in line. As we have written about before, that is only one of the complications of having a single queue in a grocery setting. Same day delivery — what can we learn from Wal-Mart de México? Has Wal-Mart figured out how to do same day delivery? The Wall Street Journal seems to think so — at least within their Mexican operations (Mexico Delivers for Wal-Mart, Feb 20). Is self-service checkout on the way out? I love self-service checkout, but it is again under attack. Here in Chicago, Jewel-Osco (one of the major local supermarket chains) is pulling self-service checkout lanes from some of its stores (Jewel scrapping self-checkout at some stores, Chicago Tribune, Sep 25). Their stated goal is to “reconnect personally with all of its customers.” Now the Wall Street Journal is piling on with an article declaring that computers just aren’t up for the job of letting people buy green beans (Humans 1, Robots 0, Oct 6). In a recent research paper called “Dancing With Robots,” the economists Frank Levy and Richard Murnane point out that computers replace human workers only when machines meet two key conditions. First, the information necessary to carry out the task must be put in a form that computers can understand, and second, the job must be routine enough that it can be expressed in a series of rules. Supermarket checkout machines meet the second of these conditions, but they fail on the first. They lack proper information to do the job a human would do. To put it another way: They can’t tell shiitakes from Shinola. Instead of identifying your produce, the machine asks you, the customer, to type in a code for every leafy green in your cart. Many times you’ll have to look up the code in an on-screen directory. If a human checker asked you to remind him what that bunch of the oblong yellow fruit in your basket was, you’d ask to see his boss. Let’s take this in two parts. First, if people prefer a conventional check out experience because that allows them to zone out then I have to wonder how Jewel’s plan to reconnect with its customers is going to work. I remember as a kid my mom having what seemed like endless conversations with cashiers. Of course, we were in a relatively small town and most of the women (they were virtually all woman) working the registers had either gone to high school with my mom or had a sibling who did. Now we live in a more class divided society. I suspect that none of the cashiers at my local Jewel are actually from the neighborhood or that the store’s staffing policies actually build in time for cashiers and customers to catch up on how their respective in-laws are doing. As Gad’s original post notes, a single checkout line is not a completely new idea for supermarkets. Indeed, Wholefoods’ Columbus Circle store has gotten all sorts of press for its single queue system. I would argue that this is a little bit different. At Wholefoods, a single queue is as much about packing many, many registers into a tight space as it is about efficiently moving customers through. That’s not really true in West Lebanon; this is pretty much your standard, large, suburban American grocery store. In West Leb, a single queue is — as the signs suggest — all about reducing customer waiting times. 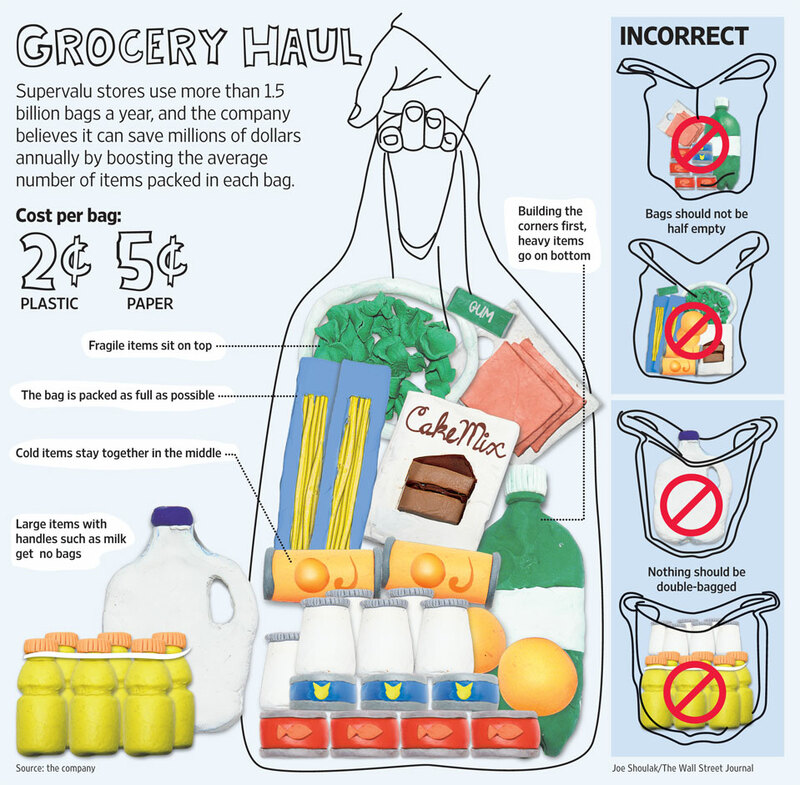 So what is it worth to reduce the use of bags at your local grocery store? OK, so for one store, it may not be worth too much, but if you have over 1,000 stores like Supervalu does, saving a few bags here and there can be real money. Thus the chain has instituted a “rigorous” program to reduce the number of bags used (At Supervalu, Cost Cuts Are in the Bag, Wall St Journal, Mar 23). The chain averages three to five items a bag, whether the bag is paper or plastic, and sells about 10 billion items annually. Since mid-2009, it has boosted its average items per bag about 5%, saving $4 million to $6 million annually even as prices for plastic bags have climbed, Mr. Siemienas says.